She’s got a voice and she is using it! 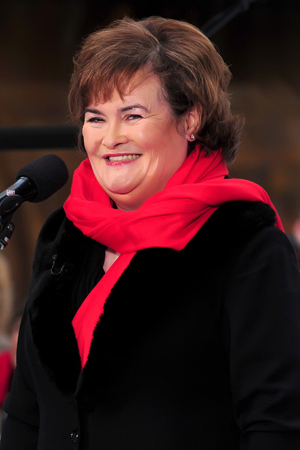 Susan Boyle responded to the insensitive jokes made by Ricky Gervais targeting the singer’s appearance. Everyone knows that Ricky Gervais has a potty mouth and the emotional consideration of a teaspoon; when he jokes, ya’ll better run for cover. But the British comedian may have outdone himself when he poked fun at Susan Boyle in a British television special that aired in October, and the Britain’s Got Talent star isn’t too happy about it. “I don’t think she’d be where she is today if it wasn’t for the fact that she looked like such a f**king mong. There is no better word to describe Susan Boyle,” said Gervais during the show. The term “mong” is a derogatory British term often used to describe individuals with Down Syndrome. Yikes. Naturally, many viewers complained to Channel 4, which broadcast the show, but it was determined that the joke did not breach their guidelines. But Boyle was not impressed with Gervais’ routine. Hollaaa, girl! Susan Boyle is just a regular woman: not airbrushed, not stuffed with Botox, not on a diet or a 7-hour-a-day gym routine… just your average 50-year-old woman. What’s wrong with that?